Jeevan Arogya is a great health insurance plan from Life Insurance Corporation of India which provides complete protection for an entire family from loss due to hospitalization and surgeries at a very nominal cost. Main Benefits of Jeevan Arogya includes Hospital Cash Benefit (HCB), Major Surgical Benefit(MSB),Day Care Procedure Benefit(DCPB) and Other Surgical Benefit(OSB). The complete details of the plan is available here. Calculation of premium for an entire family is made simple through Jeevan Arogya premium calculator. 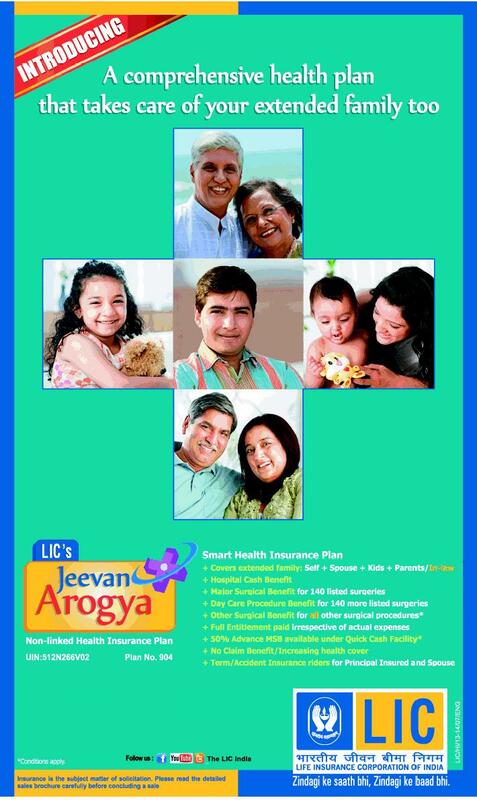 Download premium and benefit calculator of Jeevan Arogya by clicking here. HCB is the amount payable if the policy holder or other members included in the plan is hospitalized for a period more than one day (24 + 4 hours to be precise). Policy holder can choose from four slabs of Hospital Cash Benefit 1000, 2000, 3000 and 4000 initially . One day will be reduced from number of days hospitalized to find payable HCB if the days of hospitalization is less than seven days, but full days HCB will be payable if hospitalized for seven or more days. Major Surgical Benefit is the maximum amount payable to the policy holder if he undergoes a major surgery. Maximum Amount allowed for a single surgery is 100 times of applicable HCB of that particular year. Actual amount payable for a particular surgery may vary depending on the category of the surgery conducted. Complete list of major surgeries, their categories and the amount payable for Jeevan Arogya can be downloaded from here. If the policy holder undergoes a surgery which is listed under Day Care Procedure Benefit List an amount equal to five times the applicable HCB will be payable to the policy holder. Complete list of the Day care procedure allowed under the scheme can be downloaded from here. If the policy holder undergoes a surgical procedure which is not mentioned in Major surgeris or day care procedure then an amount equal to two times applicable HCB will be payable as Other Surgical Benefit. Premium paid for Jeevan Arogya is eligible for income tax rebate under the section 80D of Income Tax Act. Deduction allowed under section 80 D is up to Rs. 25000 for normal people and Rs. 30000 for senior citizens. You can calculate your tax liability and tax payable using Income Tax Calculator which can be downloaded by clicking here. Documents required for Jeevan Arogya Claim. Download Claim forms of Jeevan Arogya from here. 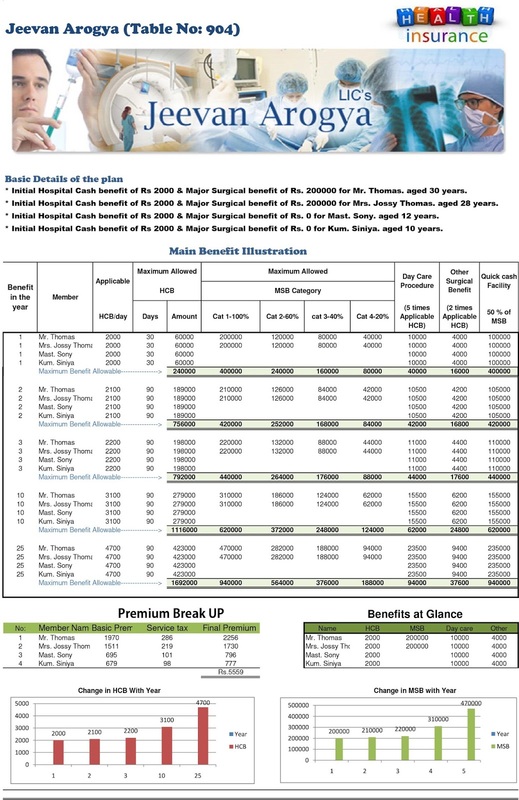 How to use Jeevan Arogya premium and benefit calculator. Jeevan Arogya calculator will help you to calculate the premium required for your entire family at a single go. Premium can be calculated for up to 15 members per family. It can also give the premium required with term rider and accident coverage which is optional. Download the premium calculator from the link provided here or below the post. You will have to enable macros from the message bar at the top of the window to make this software work. If you cannot see Enable Macros button you will have to lower the macro security level of your excel software to medium or low. If you want more information on this please click here. While opening the main menu will look like the window given below. After giving necessary details in this window you can click the “Click Here ” button to see the presentation.A sample of the presentation can be viewed here. Download Jeevan Arogya premium and benefit calculator by clicking here. If you want to download a software to calculate the maturity value and benefits of LIC policies, you can download it by clicking here. ← LIC’s New Plan – Jeevan Labh (Table 836) – Review, Benefit calculators, and comparisons. Dear Sir, with a high regard and expectation I would like you to respond to my problem, i am using 2003 office, i am unable to produce any reports from your calculators, everytime i press the button it SOFTWARE IS EXPIRED PLEASE DOWNLOAD THE NEW VERSION, what might be the reason for revolving around same loop. Use this link to get the Latest version of LIC Plan Presentation Software. This is a general plan software. I shall update the Jeevan Arogya software soon.